TS SSC/10th class Hall Tickets 2019 | BSE Telangana SSC 2019 Hall tickets download. TS SSC/10th class Hall Tickets 2019 | BSE Telangana SSC 2019 Hall tickets download from portal.bsetelangana.org : TS SSC/10th class Hall Tickets 2019 | BSE Telangana SSC 2019 Hall tickets download. 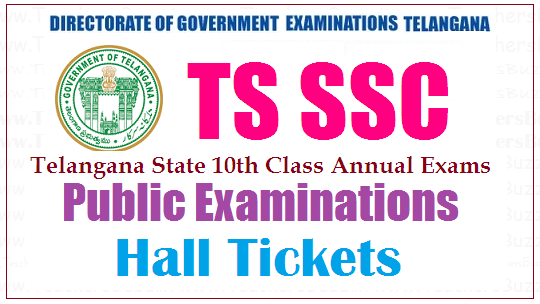 TS SSC Hall Tickets Download , TS SSC 10th class exams 2019 halltickets, TS SSC 10th class hall tickets, Admit cards, Telangana SSC 2019 hall tickets, bsetelangana.org, hall.bsetelangana.org SSC 2019 hall tickets, TS SSC public exams 2019 hall tickets. It’s the time for SSC Examinations, Every SSC /10th Class Student Must Have Hall ticket 2019 to take Public Exam The Board of Secondary Education, BSE Telangana updated exam timetable for SSC public exams 2019. The exams will be held from 16th March 2019 to 03rd April 2019. The exams will be held in different centers of the state and students studying in the schools that are recognized by the board will appear for the exams. candidates Can download TS SSC/ 10th class Hall ticket 2019 from http://bse.telangana.gov.in/. Directorate of Government Examinations is an independent department functioning under ministry of Secondary Education, Government of Telangana. The Department is responsible for conducting the SSC/OSSC Public Examinations and a number of minor examinations. Directorate of Government Examinations DGE conducts SSC/OSSC exams twice in a year and provides certification for the qualified students. Every year lakhs of students appear for the SSC annual examinations conducted by the DGE board. This DGE board also conducts advanced supplementary exams for the students who failed in the regular examinations. The BSE/ Board of Secondary Education, Telangana state government has announced the Secondary School Certificate SSC Public examinations schedule / time table for the year 2019 to be conducted in the month of March 2019. TS School Education Board conducts 10th Class Exams from 16-03-2019 to 03-04-2019. The Board of Secondary Education has clearly indicated that the students of the entire Telangana state may have follow the same methodology. The SSC Public examinations will be start from 16th March 2019 with Telugu Exam. The TS SSC Hall Tickets 2019 will be published by TS board itself. Hall tickets will be issued to each and every student who is going to appear for the exam. The board will publish hall tickets of SSC public examson its official web page. TS SSC / 10th class public exams hall tickets to be sent to all the High Schools of Telangana state on or before 6th March, 2019 and also the Candidates may download their 10th Class annual examination Hall tickets from the bsetelangana web portal from 10th March, 2019. 10th Class Board Exams would be started from March 16, 2019. Students who have not received or lost the Hall tickets shall download from the website. All the Chief Superintendents are requested to allow such candidates whose Hall tickets are downloaded. They should also check up the particulars with the photo attendance sheets. 2. Search of TS SSC March 2019 Exams Hall tickets and click on it. READ: SSC/10th Class Preperation Tips How to get 10/10 GPA in SSC Public Examinations . READ: SSC/ 10th Maths Study Material Grade Gainer| Govt Study Material for Maths T/M and E/M Download. All examinations will be held from 9.30 AM to 12.15 Noon. Each subject consists of 2 papers except II language. The exam is of 80 marks and 20 marks for internals. I paper of each subject is of 40 Marks , II paper is of 40 Marks. No objective paper is there. There will have the paper of including objective paper. All the arrangements have been completed for the for coming exams. Students of high schools are appearing exams for this time.Who are studying 10th class and going to attend Public Exams in March 2019 can download Timetable and Hall Tickets from Official website bsetelangana.org . Students who have not received or lost their Hall tickets shall download the same from the website and get them attested by the Head Master concerned / any Gazetted Officer duly affixing photographs. All the Chief Superintendents are requested to allow such candidates whose downloaded hall tickets are attested by the Headmasters of the schools concerned. They should also check up the particulars with the photo attendance sheets. The students who are going to write SSC Examinations, the Hall ticket/ admit card is an important document that every student needs to carry to the exam hall. The Invigilators will check your hall ticket and the details printed on it before allowing to take the exam everyday for all the exams. So, students are advised to carry the hall tickets to the exam hall without fail no matter what. Hall tickets will contain important information about the student like name, roll number, photograph etc. TS DGE to prevent mass copying flying squads and sitting squad are allotted for problematic centres. Except II language paper other subjects have two papers and each paper consists questions of 40 marks and total 80 marks for each subject. Internals carries of 20 Marks. There is no objective paper. Be ware when filling OMR sheet fill your Hall Tickets Number correctly. Failed candidates, Supplementary students, pvt students, and next June/July they have to write exams in CCE model only.Students should reach the exam centre 30 minutes before the exam. Students are allowed 15 min before to the exam hall. If the time exceeds 10 min (9:40 am) the students are not allowed in to the exam hall.